A ‘severe’ 6.2 magnitude earthquake today caused widespread damage and disruption through much of the southern part of the North Island. Fortunately on this occasion there were no serious casualties or loss of life during the quake or its subsequent aftershocks. Fifteen people have been locked out of their homes (locks were changed to prevent re-entry) after the three storey Daniels building on Queen Street, Masterton (below) was red stickered due to damage. 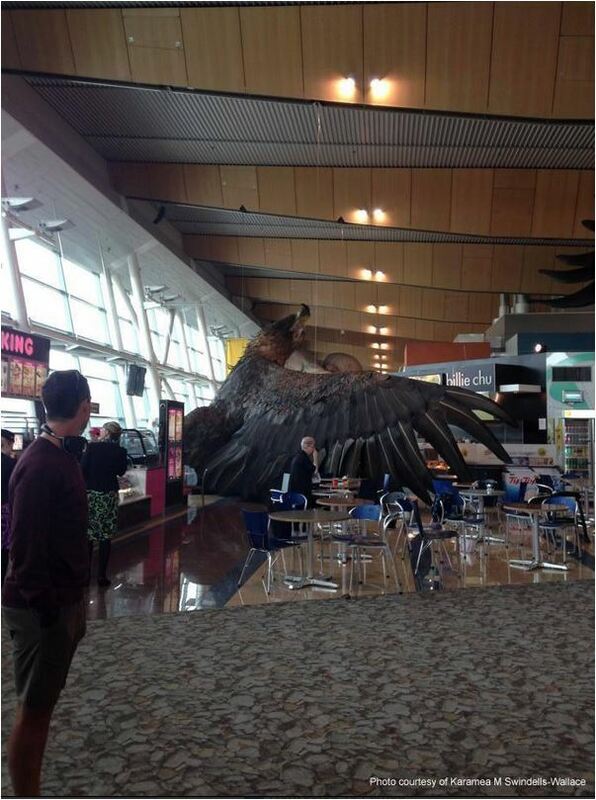 The quake shook down a massive model eagle hanging from the ceiling of Wellington airport. 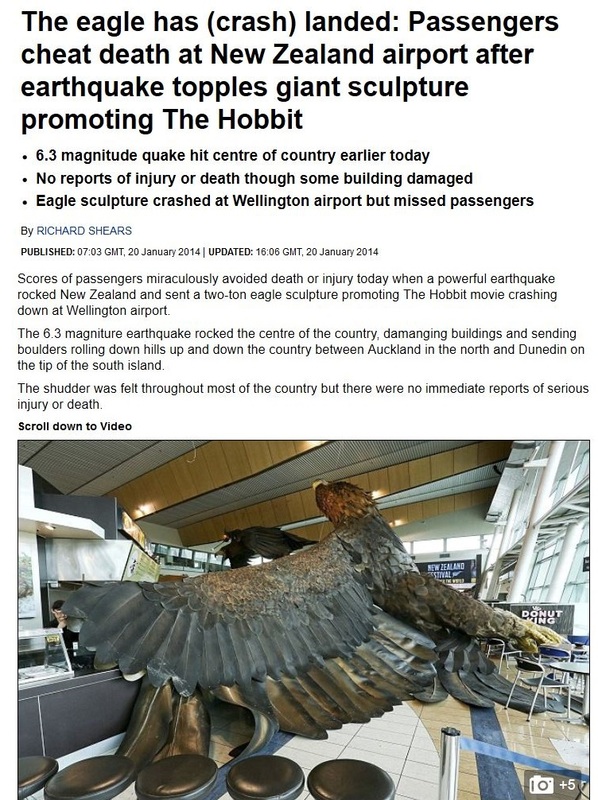 It was on display to promote the Hobbit films in the town which refers to itself as ‘Wellywood.’ The giant fantasy bird fell into an airport dining area when the first quake kicked off at 3.52pm, on one of the busiest days of the holiday season. Not only is the eagle’s demise a reminder that New Zealand is not middle earth, but the shaky isles but it also raises questions as to the wisdom of placing such a massive structure above the heads of the public. Surely the people who designed and engineered this construction have a few questions to answer about their proficiency and their reasoning for putting it where they did? Lauren Stone, 19, was sitting under the eagle with a friend when the quake struck. The wing of the giant eagle fell on top of the table and knocked it over, giving Stone a blow on the head. People were panicking: mothers screaming for their children. Initially, Stone thought a child may have been hurt. Natalie Julian, a staff member at the airport’s Donut King store, was nearby when the giant eagle fell. Scientists believe the Masterton quake wasn’t caused by a fault but was tectonic in origin. New Zealand is perched over a region where the Pacific plate slips underneath the Australian plate. This is called a subduction zone. Scientists recently said that earthquakes greater than magnitude 9 only occur in subduction zones. “GNS duty seismologist Caroline Little said yesterday’s quake was caused by the Pacific tectonic plate “subducting” under the Australian plate, and could not be pinned on an individual fault line. Late last year, GNS Science released a report showing a tsunami up to 35 metres high could cause as much devastation over Wellington and Napier as the 2011 waves caused in Japan. Professor Wouter Schellart from Monash University said a tsunami generated by a giant earthquake on the Tonga-Kermadec-Hikurangi fault would have the same impact as the Japan earthquake and tsunami of 2011. Waves could reach New Zealand in as little as 10 minutes, giving little time for an effective warning. The deadly earthquakes that shook New Zealand in 2010 and 2011 may have caused a part of the Earth’s crust to weaken. According to researchers, New Zealand is in the Ring of Fire – a narrow zone in the Pacific Ocean wherein 80 per cent of the biggest earthquakes in the world happen. Fortunately for Masterton a high number of its earthquake prone buildings were destroyed in a war-time quake in 1942, the Daniels Building must’ve escaped it somehow. People are starting to notice a link between mass whale strandings and earthquakes in New Zealand. Dozens of pilot whales have been stranded at Farewell Spit in Golden Bay during the last month. Some were helped back into the sea but re-stranded days afterwards. …In the latest bizarre incident on Sunday, less than 48 hours before the earthquake hit, a pod of whales beached themselves near Cavalier Creek on Stewart Island. The New Zealand government and the Earthquake Commission have suppressed information about the seismic risks in New Zealand to defraud international reinsurers and pay lower reinsurance premiums along with assuaging the fears of the population. For example, seismic research undertaken about thirty years ago showed the existence of the supposedly unknown faults in Christchurch. The New Zealand government recalled the maps and produced alternative maps showing no faults underneath Christchurch, as it would potentially upset property owners or bring about pressure to upgrade earthquake prone buildings, which would cost the landlords money. For migrants reading this blog, the landlord lobby is sacrosanct because everyone in New Zealand that has money owns rental property, including politicians. From my previous work, I am aware that the Alpine Fault along the South Island has historically produced magnitude 8 or larger earthquakes every 300 years. The last rupture was around 1,700 meaning that the Alpine Fault should produce another major earthquake in the near future. Unlike ordinary earthquakes, this type of earthquake would produce a rupture along hundreds of kilometres of fault from Fiordland up the West Coast into Marlborough, along with magnitude 6 or 7 shaking as far away as Wellington and Christchurch. Contrary to the propaganda of the New Zealand government, New Zealand construction is ill prepared to handle earthquakes. Many commercial buildings are not up to the proper standard. For example, some commercial buildings in Christchurch are commercial write offs, yet insurers have insisted on injecting epoxy into cracks in the foundations or walls. The epoxy in the concrete will easily buckle next time the building experiences an earthquake meaning the building is will be prone to collapsing much more easily during the next earthquake. Engineers design buildings not to collapse in an earthquake to save lives. However, the earthquake renders these buildings write offs after the shaking has stopped. Additionally, New Zealand also has faults off the coast capable of producing large earthquakes. This would result in a tsunami hitting the shores within minutes. Compared to Japan, New Zealand’s tsunami preparation is primitive. In Japan, cell phones have emergency warning systems that warn of earthquakes and tsunamis as they happen. Depending on how far one is from the earthquake, the message can reach your phone seconds before the shaking does. In the case of Japan during the 2011 earthquake and tsunami, Tokyo was far enough from the epicentre of the offshore earthquake to set off the offshore earthquake sensors and send an electronic signal to people warning them of the earthquake seconds before the shaking reached Tokyo. New Zealand will have a magnitude 9 megaquake eventually and the country is ill prepared to deal with the aftermath. People in small towns along the West Coast will end up stranded for weeks or months as landslides block roads. Likewise, the same will potentially happen to Wellington with hundreds of thousands without the ability to escape except by sea. New Zealand does not have the infrastructure to supply Wellington with food, water, and emergency supplies if an earthquake triggered landslides that halted basic services and blocked off the city. The only thing that will be worse than the earthquake is the shocking response from the New Zealand authorities. The bogans like Gerry Brownlee (the semiliterate Minister of Earthquake Recovery) will oversee this response. Just picture lazy, incompetent, and indecisive Kiwis coordinating a response to a calamity, something that would be enormously difficult even for the most capable and well-trained people. The Number 8 Wire mentality and “she’ll be right attitude” will be worse than the earthquake and aftershocks, as the current Christchurch fiasco shows. Three years after the earthquakes, some vulnerable individuals still do not have running water and toilets, whilst EQC managers have prioritised their own claims and milked the system. Imagine what will happen when a magnitude 9 hits New Zealand. The Kiwis point out to the “unprecedented” disaster in Christchurch, yet Japan and Chile have recovered far more quickly from much larger and devastating earthquakes. For and prospective migrants, please remember that the Kiwis are not the Germans or Japans. West Germany produced as much economic output in 1948 as it had in 1939 despite the war destroying much of the country’s productive infrastructure in tatters and leaving millions homeless. The difference between the work ethic and organisational acumen of the Germans and the Kiwis are enormous. Please keep this in mind before you make the move. If anyone has questions, please feel free to reply and I will answer them. “Gerry Brownlee is the minister in charge of EQC. He may not work for EQC, but he definitely deserves to be mentioned as one of the EQC Royals. Gerry has a colourful background. He played rugby growing up and was a school bully when he went to St Bede’s. He also bullied a disabled student that was much smaller than him. Most people don’t know about Gerry the alcoholic. One man says, “I went to work one morning and I saw Gerry Brownlee outside the pub, hung over, and just making a fool of himself”. Gerry is an angry drunk. Some people are drunk and funny, but Gerry is drunk and violent. The fun continues at the site. Remember Finnish Comic Responds To Jerry Brownlee, Minister for Earthquake Recovery? Added to our sites list.